River Plate, Uruguay - Strait of Magellan, Chile During this leg of the voyage, Drake anchored 14 times. However, only one anchorage has retained its name. Ray Aker compared charts and Sailing Directions with Drake's approximate stated latitudes and geographical descriptions, to identify tentatively the likes of Drake's: Cape Joy; Cape Hope; Seal Bay and various unnamed havens. I covered 800 miles aboard a 43 feet sailing yacht in the depths of stormy winter, when Drake was here. This intimate reconstruction confirmed all Mr Aker's plottings. Furthermore, I discovered a possible contemporary error. 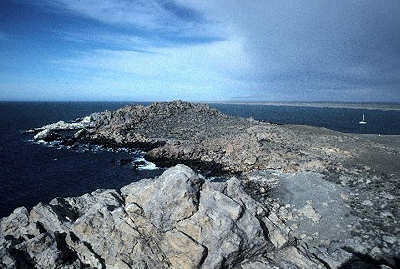 Cape Joy was a seal inhabited island at the end of an isthmus. This only matches Cape Hope, 1,000 miles south in Argentina. Cape Hope is today's Cape Blanco that seems to have been described out of sequence.